Amy Poehler and Tina Fey do not disappoint. Last night at the 2013 Golden Globe Awards was no exception. Poehler: "It was a great year for film, women in film. Kathryn Bigelow nominated tonight. This line got quite the laugh - one of the better ones of the evening. And from a body language perspective it also served up some great demonstrations. Jessica Chastain (the lead actor in Zero Dark Thirty, in a teal colored dress to the left side of the screen) during the 0:19 - 0:21 segment, opens her eyelids extremely widely in what was a very nonverbal signal of sincere surprise. Her mouth also opens widely and takes on a vertical-oval shape. This mouth configuration is also extremely characteristic of significant surprise. In less dramatic examples of surprise, the eyelids tend to open more so (proportionately) than does the mouth. When people hear or see something that surprises them, a rapid covering of the mouth often occurs. It's very similar to what happens when one hears a lie (whether the deception is uttered by them or another person, e.g. "I can't believe he said that!") - a covering of the mouth is very common. In the context of surprise or psychological shock (extreme emotional processing and in part coveys empathy), this mouth covering tends to be very rapid (e.g. watching a car accident or hearing about a loved-ones sudden illness, etc.). This body language of embarrassment-surprise-emotional processing was seen several times in just a few second last night. Chastain covers her mouth at 0:20 - 0:23 while Mel Gibson (in foreground) covers his mouth somewhat slower at (0:21 - 0:23) while Joaquin Phoenix maintains a pretty good poker face - and yet his real emotions show as he performs a quite rapid eye-rub/mouth cover (a dual signal) at 0:19 - 0:20. Bigelow's variation of a mouth cover comes in the form of a hair-adjust, which serves a dual-role of a MAP (manipulator, adaptor, pacifier) at 0:21 - 0:23. Another great nonverbal tell in this segment is seen by Tina Fey. 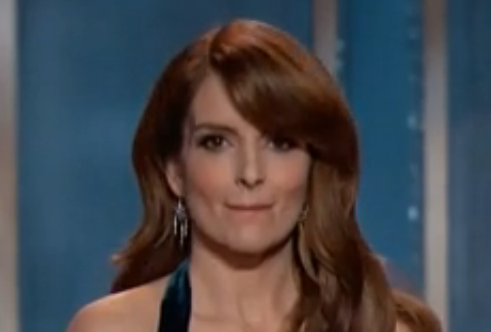 At 0:18 - 0:19 seconds, just after Poehler delivers, Fey displays an Inward Lip Roll (ILR). The inward lip roll is a signal of anxiety, and more specifically it is very commonly seen when there is an attempt being made to squelch emotion. Very typically it is anger or sadness that the psyche is trying to suppress - but here Fey is trying to not openly demonstrate her joy-laugher. Thus it's common to see an ILR in a comedic situation. Hmmmm.... I wonder what James Cameron's face looked like?